(aka F.X. Matt Brewing Co. The West End Brewing Company was founded by F.X. Matt in 1888 in Utica, New York on a site that had previously been the location of the Charles Bierbauer Brewery. During Prohibition, the brewery survived by producing soft drinks, malt syrup, malt tonic, extracts, etc. The Utica Club name dates from this period, when it was used for a line of soft drinks. Returning to brewing real beer after Prohibition the brewery's flagship brand became Utica Club, a name that it had adopted for its soft drink line. Around 1950, it acquired the rights to the Fort Schuyler brand from its local rival, Utica Brewing Company. Still family owned by the Matt family, it has also used the F.X. Matt Brewing Company name. 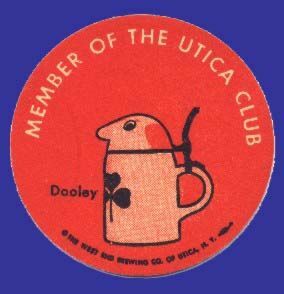 During the 1950s and 60s, two of the most recognizable advertising characters on upstate New York television were Schultz and Dooley, the animated beer tankards that promoted Utica Club brands. Schultz and Dooley's voices were provided by legendary comedian Jonathan Winters. The ads were so popular that the two original characters were later joined by a number of other animated steins, including Officer Sudds, Farmer Mugee, the Countess and many others. West End survived the nationwide brewing consolidation of the 1960s and 70s by providing quality products to retain its regional customer base and by brewing private label and generic brands to use excess capacity. For example, it was one of four regional brewers that produced the short-lived "Billy Beer", honoring presidential sibling Billy Carter, in the late-1970s. At the time of this writing, West End is in its 112th year of operation, having survived not only prohibition, but the consolidation of the brewing industry in the 1960s and 70s. It has now repositioned itself as a craft brewery, with it's diverse Saranac brands being widely distributed throughout the east and highly regarded. Use the links along the left border to view some of the breweriana from the West End Brewing Company.